Meet Charlotte! If you have been to Dermatology Consultants in the past year, you have probably been greeted by Charlotte. She is one of two lovely ladies at our front desk. 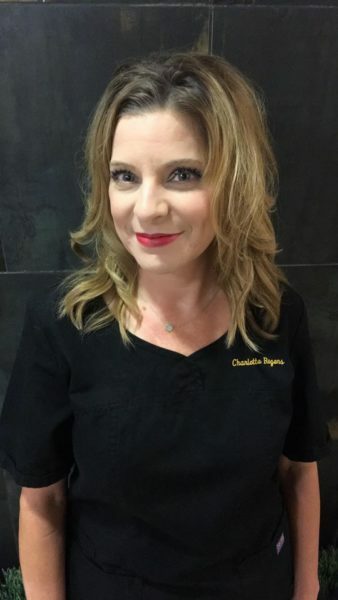 Charlotte will be celebrating her one year anniversary at Dermatology Consultants of Dallas and we thought you might like to know more about her. Charlotte has been working in the medical field since 1994. She has worked in Nephrology, Cardiology, Ear, Nose and Throat and Physical Therapy. She has also worked as a Certified Nurse Aide with Alzheimer’s patients. She says her work with Alzheimer’s patients was rewarding but exhausting. I can relate to that since I have a father with Alzheimer. Charlotte has stayed in the medical field because she enjoys interacting with patients. She is a people person. This is the first time Charlotte has worked for a Dermatology office and I am happy to report it has been one of her favorite places to work. When asked what she likes most about working here, she states, “first and foremost is the staff, her co-workers and the laid back atmosphere.” Her least favorite part is the commute, she lives in the Fort Worth area. Charlotte has lived in Bay City and San Antonio. She moved to the Dallas/ Fort Worth area about two years ago. About Fort Worth, she says she has enjoyed visiting the stock yards, going to the symphony and church. Her favorite thing to do is hang out at Central Market where they have live bands and food trucks on Saturdays! Her favorite food is salsa and chips. Charlotte’s favorite skin care product at Dermatology Consultants is Ageless which she says has made her skin look brighter and healthier. She also loves Dermablend make up, and uses it every day as her foundation. She describes it as light and silky, it provides full coverage without looking cakey. Her favorite procedure to have done is our NEW Dermalinfusion , its so refreshing and rejuvenating. We are delighted to have Charlotte on our team at Dermatology Consultants. Join us as we congratulate her on her one year anniversary. HAPPY ONE YEAR ANNIVERSARY CHERYL!! !